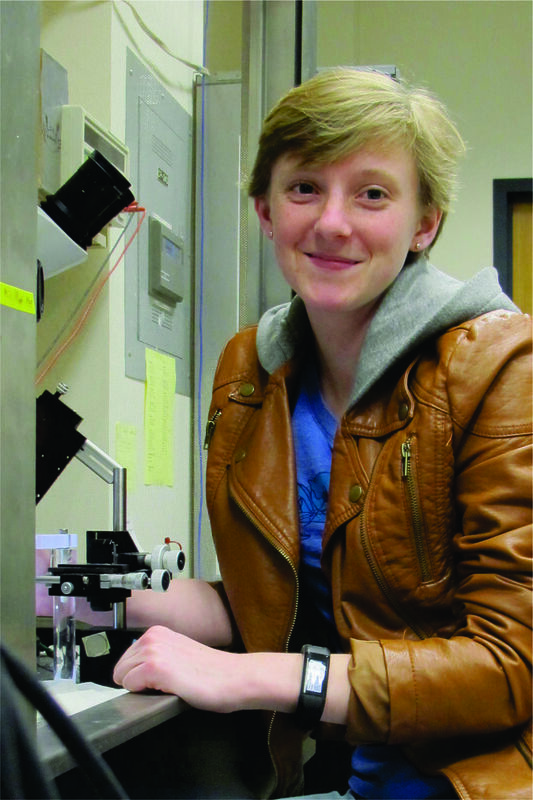 Margaret DeMaegd spends most of her day in a lab. A doctoral student studying neuroscience and physiology at Illinois State University, her research examines sensory responses in crabs. Though her days are filled with microscopes and crustaceans, the work is carrying DeMaegd to presentations at points around the globe. DeMaegd has displayed and presented her work at the Annual Meeting of the Society for Neuroscience in Washington D.C., the International Congress of Neuroethology in Brisbane, Australia; and recently at the 111th Meeting of the German Zoological Society in Greifswald, Germany, where she was honored for the best poster presentation. DeMaegd noted Wolfgang Stein is always encouraging students to present. “He calls it ‘public outreach.’ I call it having an amazing mentor,” she said. In her work, DeMaegd studies how information from once sense, like smell, can influence a difference sense, like muscle tension in the stomach. She finds that the sensory neurons for smell send information (action potentials) backward in the sensory neuron for muscle tension. “The backward travelling action potentials change how excitable the neuron is and this in turn changes how sensitive it is to changes in muscle tension. It means that when the crab smells something, the stomach get prepared,” she said. Stein and DeMaegd actively work to find travel grant and awards to help offset the costs of presentation travel. DeMaegd is a current recipient of the Trainee Professional Development Award of the Society for Neuroscience, the Omar Rilett travel grant, the McLean County STEM Gala Outstanding College Student Scholarship, and the ISU College of Arts and Sciences Graduate Student Travel Grant.